WASHINGTON, D.C. -- Vice President Joe Biden and President Barack Obama announced the Administration's strategy to prevent gun violence on Wednesday. Some of the actions and proposals set forth by the President during his speech included twenty-three separate Executive Orders he will issue as President. Obama also called on Congress to enact tougher anti-gun laws such as the reinstatement of the Assault Weapons Ban, a Universal Background Check, and the appointment of a director of the Bureau of Alcohol, Tobacco and Firearms. "Since Congress hasn’t confirmed a director of the Bureau of Alcohol, Tobacco and Firearms in six years, they should confirm Todd Jones, who will be -- who has been Acting, and I will be nominating for the post," Obama said. Referring to the Sandy Hook school shootings in Newtown, Connecticut as the call to action for more gun control laws, Vice President Joe Biden said, "No one can know for certain if this senseless act could have been prevented, but we all know we have a moral obligation to do everything in our power to diminish the prospect that something like this could happen again." Biden acknowledged that although there is no perfect law to prevent gun violence, it shouldn't stop the White House from going forward with its push for more gun control. "We should do as much as we can, as quickly as we can," said Biden. "And we cannot let the perfect be the enemy of the good." President Obama echoed Biden's sentiment, "While there is no law or set of laws that can prevent every senseless act of violence completely, no piece of legislation that will prevent every tragedy, every act of evil, if there is even one thing we can do to reduce this violence, if there is even one life that can be saved, then we've got an obligation to try." One of President Obama's Executive Orders will direct government-funded scientific research into the causal relationships of gun violence. The President blamed gun supporters for the lack of research in this area of study. 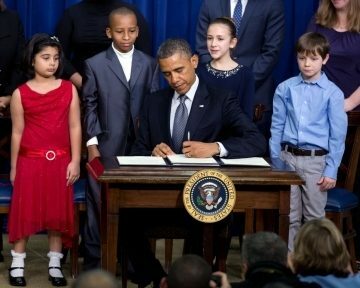 "While year after year, those who oppose even modest gun safety measures have threatened to defund scientific or medical research into the causes of gun violence, I will direct the Centers for Disease Control to go ahead and study the best ways to reduce it -- and Congress should fund research into the effects that violent video games have on young minds," Obama said. "We don't benefit from ignorance. We don't benefit from not knowing the science of this epidemic of violence." "I’m calling on Congress to pass some very specific proposals right away," Obama said. "It’s time for Congress to require a universal background check for anyone trying to buy a gun. The law already requires licensed gun dealers to run background checks, and over the last 14 years that’s kept 1.5 million of the wrong people from getting their hands on a gun. But it’s hard to enforce that law when as many as 40 percent of all gun purchases are conducted without a background check." "Congress should restore a ban on military-style assault weapons, and a 10-round limit for magazines," Obama said. "The type of assault rifle used in Aurora, for example, when paired with high-capacity magazines, has one purpose -- to pump out as many bullets as possible, as quickly as possible; to do as much damage, using bullets often designed to inflict maximum damage." "Let me be absolutely clear. Like most Americans, I believe the Second Amendment guarantees an individual right to bear arms. There are millions of responsible, law-abiding gun owners in America who cherish their right to bear arms for hunting, or sport, or protection, or collection," Obama said. "There will be pundits and politicians and special interest lobbyists publicly warning of a tyrannical, all-out assault on liberty -- not because that’s true, but because they want to gin up fear or higher ratings or revenue for themselves."